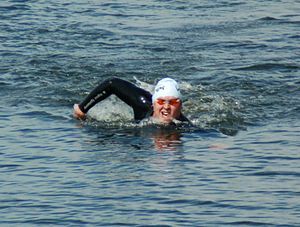 Concerns for wildlife could scupper plans to stage open water swimming in a lake at a nature reserve, reports the Leicester Mercury. Dishley Pool, near Loughborough, has been earmarked as a suitable location for outdoor swimming by sporting events firm Racetime Events, it is hoped that the facility would enable training for the triathlon in preparation for the Olympics later this year but this is now doubtful as Charnwood Borough Council, which owns the site off Derby Road, have recommended an application to change the use of the pool be refused by councillors. Outdoor swimming resurfaced after centuries of neglect right here in Britain during the industrial revolution. Yet since the 1970s outdoor swimming has been rigorously opposed in England despite very different attitudes throughout the rest of Europe. It is true that wildlife has taken over at neglected swimming holes in the mean time, but outdoor swimmers are very sensitive to their environment. Unhappy with swimming in unnatural chlorinated waters when they enter open water they treat it with due respect. Simply by designating a small stretch of the bank for the use of swimmers, habitats are preserved and disturbance to wildlife is negligible. The whole issue of the right to swim in inland open waters is a hot topic at the moment. A campaign to get British Waterways to allow swimming to continue at Sparth, Huddersfield has been met with understanding by officials. Determined to bring an end to unreasoning prejudice towards open water swimmers, NO SWIMMING signs are soon to be removed and replaced with information boards instead. This represents a turn in the tide of opposition so prevalent until now. In fact this momentous change in the swimmers fortune has attracted the attention of the BBC who intends to run a feature on the current affairs program Inside Out. It is proposed to allow swimming at Rutland Water this year should water levels be suitable, the very idea of which would have been unthinkable two or three years ago. In view of this perhaps now is the time to reconsider the fate of swimmers today. Read the fascinating story of open water swimming.